Trying to find a new time tracking software to keep track of yours and your employees’ productivity? Well you’ve come to the right place! In this complete guide we have reviewed what we believe to be the leading time tracking software solutions. Find out exactly what we like and what we dislike about each of the products, and use the accompanying table and buyer’s guide to choose a product based on the needs of your business. Use the table and reviews below to compare the 5 best time management software solutions that we have chosen to help you make the right purchasing decision. Time Doctor is the winner of our best overall time tracking software of 2018 award. It does everything your small business will need it to do with as few faults as possible. With it you can track your employees’ productivity and manage your projects in a seamless fashion. It stands out especially as an employee activity monitoring tool, so if you are looking for a way to keep any eye on employees, then Time Doctor is the right product for you. Where Time Doctor does fall slightly short is the price. At a flat $9.99/user/month, it may fall outside the budget of your average small business. It does, however, offer a free plan with limited functionality. Though you won’t have access to the employee monitoring tools, the free version does have its merits as a purely time tracking software. Time Doctor does everything we think is necessary for a time tracking software to do. Project time tracking, staff activity tracking and daily time logs visualized on a simple timeline; Time Doctor has your basics covered. Where it excels, however, is its employee monitoring tools. Time Doctor gives you the ability to set scheduled screenshots, record mouse and keyboard activity, track employee movements using GPS and the mobile app, and provide detailed reports on employee application and website usage. Your employees’ productivity will shoot through the roof knowing that they are being monitored. The only downside we could mention is the outdated user interface. It looks as though it hasn’t received an overhaul in this regard since the day it was developed. Okay, maybe we exaggerate a bit, but it certainly could use a facelift. Though old and boring, the UI is still functional and easy to use, so we can’t complain too much. Time Doctor is a powerful time keeping application, with top notch employee activity tracking. Perfect for small businesses that want to keep a strict eye on the productivity and movements of employees. TimeCamp wins our Editor’s Choice award in our top 5 time keeping software for small businesses of 2018 review. It’s one of the most complete time keeping software solutions currently on the market, and comes at an attractive price too. It’s easy to use in its simplicity, and offers a wide range of features that will ensure improved productivity in your small business’s activities. TimeCamp offers a free version of their time keeping software, though it has a pretty limited feature set (it pretty much can only be used for time tracking). Aside from that, TImeCamp has two plans targeted at small businesses. Starting at 5.25/user/month for their “Basic” plan, then stepping up to $7.50/user/month for the “Pro” plan. The simple and appealing user interface of TimeCamp makes it a pleasure to use, and even the earliest of beginners should be able to adapt to using it in no time. This is one of the categories that TimeCamp really stands out in: its ease of use. You’ll save both time and money in implementing it, and it won’t get in your or your employees’ way as it tracks your activities and productivity. One feature we do miss in TimeCamp is the lack of GPS tracking using the mobile application. Though not all businesses need it, it could prove vital for those whose employees work in separate locations or in delivery. A small feature, but one that would be nice to have nonetheless. 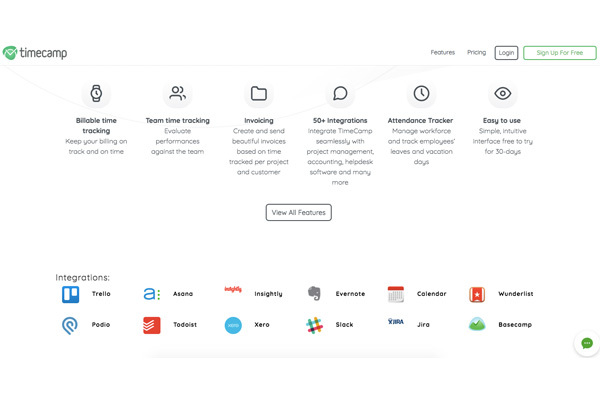 Aside from that one missing feature, TimeCamp has you covered in all the functionality your small business should need in a time tracking software. It can track your employees’ application and web usage, provides useful reports that track your productive and unproductive time, it sends a weekly email summary of productivity levels, and much more. An easy to use and relatively affordable time tracking software solution, Timecamp offers additional invoicing tools on top of their already functional tracking software. Hubstaff is a popular and feature-rich time tracking software. Though it can get relatively pricey, it is well worth it for the functionality and insights that it can provide. It will help your employees reach new heights with its monitoring capabilities, and won’t intrude on their lives too much with the attractive and easy to use user interface. 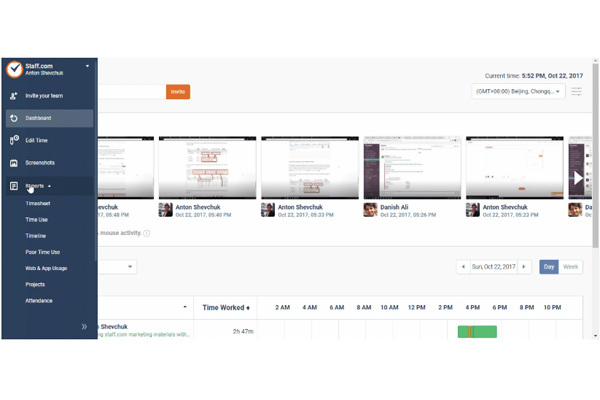 Hubstaff offers a free version for just one user, so it may not be of much use for small businesses that want to track the productivity of small teams. After that, for the “Basic” plan, Hubstaff charges roughly $4/user/month for anywhere up to 50 users. Their “Premium” plan is $8/user/month, also for up to 50 users. Though that Basic plan is a pretty affordable option, we’re pretty disappointed with how lacking the feature set is compared to the Premium plan. If you decide to invest in the Premium plan, everything you need in terms of features will be covered by Hubstaff. Time tracking, activity level tracking based on mouse and keyboard usage, integrations with a number of project management solutions, mobile GPS tracking, and randomized screenshots; you definitely won’t be let down. An additional bit of functionality that Hubstaff offers that we definitely liked was payroll management. Using the information gathered in your project and employee time tracking, and the fact that Hubstaff integrates with applications like PayPal, you can seamlessly manage your payroll right from within Hubstaff itself. Hubstaff is also one of the more attractive and easy to use time tracking solutions on the market right now. If ease of use is a big must in your eyes, then Hubstaff will definitely be worth a look for implementation into your business. Though it comes at a price, Hubstaff is a powerful time and productivity tracking software. Perfect for small businesses that have a big budget and want a lot of functionality. DeskTime is a time tracking software that focuses mostly on employee productivity. It offers some pretty powerful tools that will help keep your projects organized and as efficient as possible. 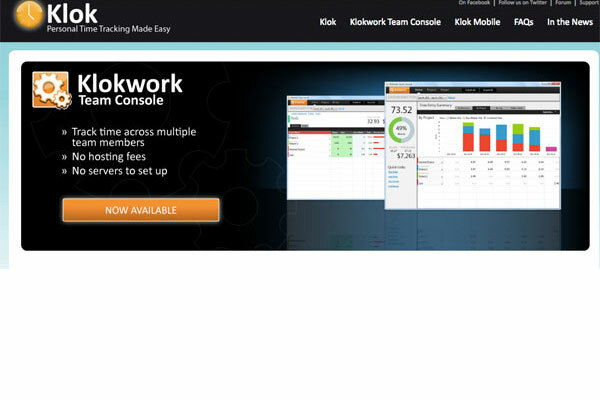 There is a free version of DeskTime available that has limited time and application tracking features. Otherwise there is one paid plan that starts at $7/month for 1 user, then scales up with each additional user (i.e. $18/month for 3 users, $30/month for 5 users, etc.). A bit pricier than most small businesses will want to be spending on time tracking software, but by no means the most expensive on the market. According to DeskTime’s website, they have proven it to boost employee productivity by 30% in the first few weeks of using it. Whether this is due to the fact that employees feel less comfortable slacking off knowing they are being watched or the insights the software provides them on their weekly activities isn’t quite obvious; but it’s a good result nonetheless. DeskTime offers a nice feature that we think will give employees incentive to be productive throughout the duration of projects or normal working weeks: employee productivity rankings. If it’s a competitive environment, this could drive employees to try work just that little bit harder to see themselves on top of that list. Aside from this, DeskTime also covers pretty much all the basics. 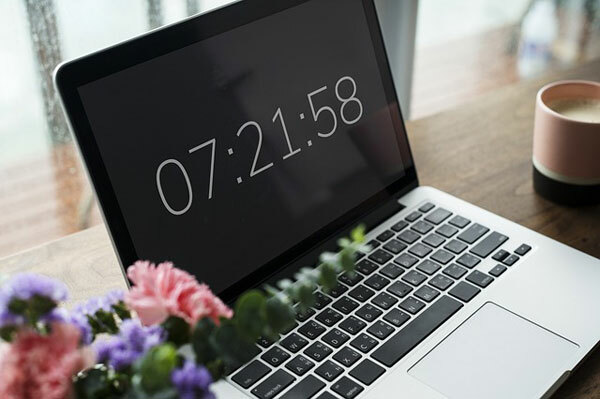 It tracks employee web and application usage, has a customizable Promodoro timer that will ensure employees take regular breaks, cost calculations and project billing, and gives you the ability to schedule screenshots of your employees’ screens. The only issues we found were the relatively lacking reporting functions that didn’t provide as much insight into the productivity of employees as we’d like, and a few other small features missing here and there that would make for an overall cleaner experience. DeskTime is a useful time and productivity tracking software that can help take your team to new productive heights. RescueTime for organisations is a time tracking software solution that has a relatively small feature set, but does well what it says it will. It’s by no means the most powerful product on the market, but it may just get the job done well enough for small teams that are looking for just time tracking functionality and have a need for productivity optimization. RescueTime has only two options for pricing plans: free forever and Premium. Premium goes for $9/user/month, so it’s not exactly a budget-friendly option for most small businesses. However, there is a case to be argued for the free version of RescueTime if you are just looking for simple time tracking software. What the free version does well is allow you to set goals for your productivity levels, then it tracks your time on websites and applications and provides detailed weekly email reports with insights. These email summary reports can help you figure out just where you are losing your time during the week, and hopefully help you achieve a new level of productivity. That being said, the free version doesn’t do too much more. The Premium plan does much the same but with some more advanced reporting and idle time features. As such, we’d venture to say that the Premium plan isn’t much worth it, because it lacks the powerful features that you could easily get for $9/user/month using other time tracking and productivity software solutions. 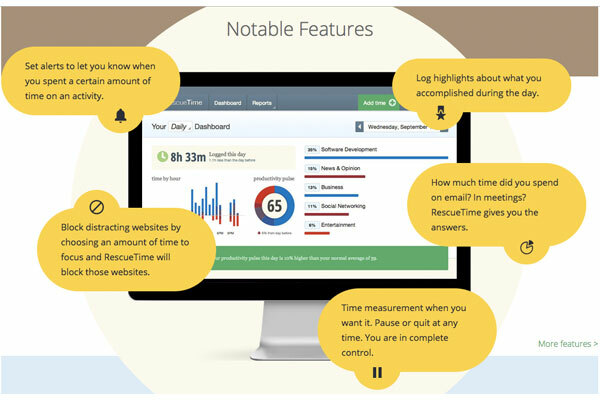 RescueTime is a lightweight time tracking software that has a strong case for its free version. Perfect for small businesses that have basic needs and don’t have any form of budget for time tracking software. 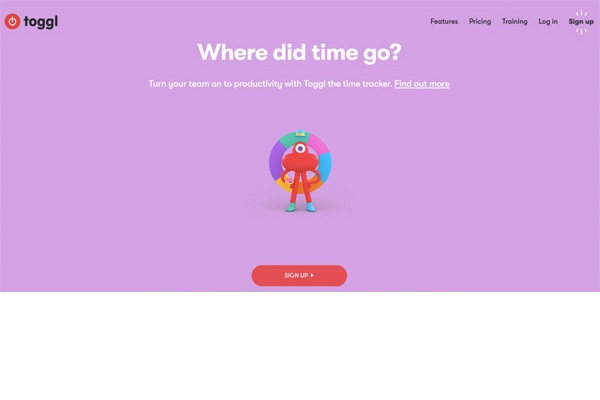 Two time management software solutions that we’d like to give an honourable mention are Toggl and Klok. 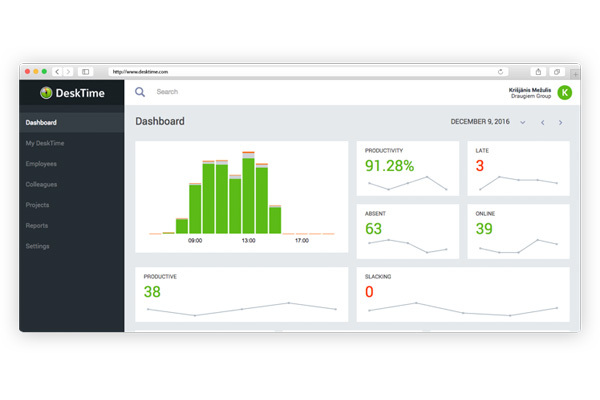 Toggl is a popular app with a beautiful interface that covers all of the basics, but also supports separate teams within one business. 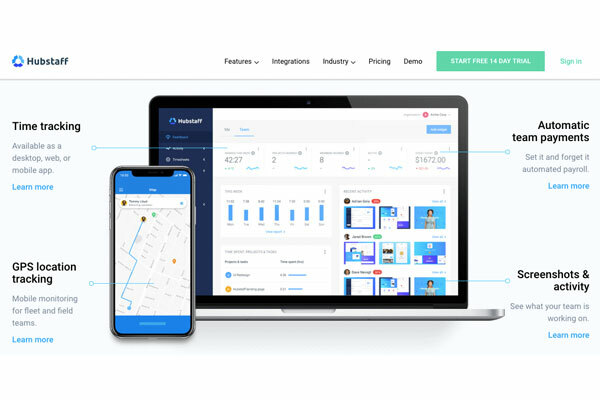 It focuses on team time tracking that provides assurance to clients with transparent reporting, and starts at $9/user/month (Starter), then steps up to $18/user/month (Premium). Klok is unique on this list as it isn’t sold as a cloud-based software, but rather a desktop-based application. It offers simple time tracking tools and displays the gathered information in intuitive pie chart-type rings. It starts at $19/user for a 3 user-license pack, $18/user for 5 and 10 user-licence pack, and $16/user for a 30 user-licence pack. Don’t know what you should be looking for in time tracking software? Well we’ve got you covered in this time tracking software buyer’s guide. We have detailed the categories that we believe to be the most important to consider when choosing a new product to implement into your business to improve your productivity and time management. Remember to consider the needs of your own business before reading any of this. You don’t want to be stuck in a year-long contract paying for a product that has features that you will never use. Price is always of top concern for small businesses looking to implement new technologies into their business’s operations. You don’t have the luxury of enough free cash flows to invest in enterprise level software, so you’ll have to be careful to choose the product that covers your basic time tracking and productivity monitoring needs for the lowest possible price. Just remember this: the more features you want, the more you will have to pay. Don’t be greedy. It’s important to ensure that an application that is supposed to improve the productivity of your staff doesn’t distract them by being complex and difficult to use. You want something that will stay largely out of their way, but has a simple UI for those times when they do have to make use of it. On top of this, you’ll want a simple software because it will be cheaper and won’t take as much time to implement. The longer you have to spend training staff to use the software, the less time they can spending being productive and the less money your business will be making. These features will allow you to properly manage the activity levels of your small business’s teams and, hopefully, ensure that their productivity levels increase to new, greater levels. This is, after all, the point of implementing time tracking software in the first place. This is a more subjective category, but one we feel important to mention nonetheless. If your business relies on employees who work in separate locations from the main office or in delivery, it’s important that you can track their movements to ensure they are where they are meant to be. Especially if some of your employees are working projects in other locations, you want to ensure that you can bill your client for as many of those hours as possible.